Of the female contemporary artists who have come to prominence in the last few decades, Katarzyna Kozyra (b. 1963 in Warsaw, where she currently lives and works) is certainly one the most eclectic personalities, characterized by an extraordinary and unique evolving nature. This latter trait has allowed her to move without hesitation between the realms of sculpture, installation, performance art, photography, and video; these domains are the expression of a refined modus operandi (way of working) that investigates many of the corners of her Self in an unprecedented and uncensored way, but they are also the extension of her modus vivendi (way of living). They are hybrids in which art and life overlap, adhere, and nurture each other in an incessant race to construct (if possible) and deconstruct the portrait of a woman who constantly reinvents herself, but not merely to please herself. Kozyra's discourse is intimate yet distant, personal yet universal, gender-specific yet trans-gender. Her work reflects her ability to mix different artistic genres, but it also shows the semantic implications of her ethos, in which the feminine and the masculine worlds meet, collide, and sometimes even destroy one another. These encounters give way to new possibilities of being in which the high and the low, the underground and the mainstream, the naive and the disturbing, the ironic and the dramatic, blur and mix to create visual dichotomies, trigger the viewer’s imagination, and most of all, highlight questions that embrace the ontological dimension of art as well as the ethical, societal, cultural, and religious dimensions of existence at large. There is no topic that Kozyra has avoided. She is her own actor, spectator, and muse. This attitude has brought her to the forefront of her artistic creations, with an uncompromising and rare directness. Kozyra’s activities have been crucial in the development of the Polish art movement known as Critical Art, and they have heavily influenced Polish contemporary culture, often as a starting point for a broader discussion at an international level. 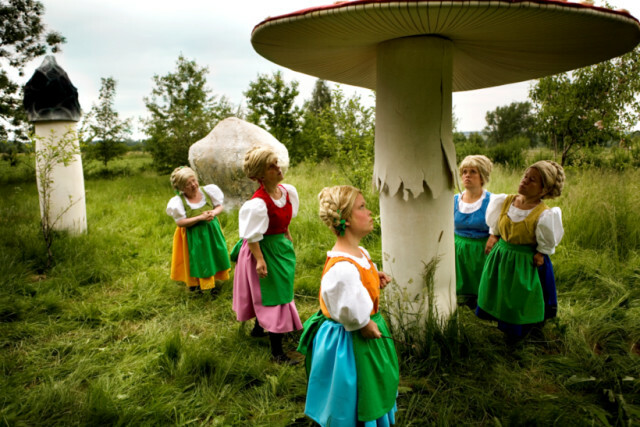 In 2013, the Huffington Post named Katarzyna Kozyra one of the ten most important female artists of the new millennium. She graduated from the Sculpture Department at the Academy of Fine Arts in Warsaw in 1993. In 1998, she finished her postgraduate work in the New Media Department at the Hochschule für Graphik und Buchkunst in Leipzig with Prof. Helmut Mark. In 2011, she obtained her doctorate from the Academy of Fine Arts in Warsaw. Over the last few decades, Kozyra’s work has been exhibited at major museums and institutions worldwide, including the Venice Biennale (Venice), São Paulo Biennale (São Paulo), Sidney Biennale (Sidney), Busan Biennale (Busan), Kunstsammlung Nordrhein Westfalen (Düsseldorf), Kulturhuset (Stockholm), Museum Voor Moderne Kunst (Arnhem), Museum Moderner Kunst Stiftung Ludwig (Wien), Brooklyn Museum (New York), Kiasma Museum of Contemporary Art (Helsinki), CCA (Tel-Aviv), Three Shadows Photography Art Centre (Beijing) among others. She has received the Paszport Polityki Award (1997), the Award of the Ministry of Culture and National Heritage (2011), and the Polish Film Institute / Museum of Modern Art Award at the 39th Film Festival in Gdynia for her idea for an experimental movie Project X. In 1999, she received an honorable mention at the 48th Venice Biennale for the video installation Men’s Bathhouse, exhibited in the Polish Pavilion. She has received a number of grants, such as the DAAD Scholarship (Berlin 2003) and the Kosciuszko Foundation Scholarship (New York 2000). In 2012, she established the Katarzyna Kozyra Foundation, which focuses on supporting women’s activities in the area of culture and art.